As much as I love fiber.. I love to cook!! I haven’t has as much time as I like recently, so having this long weekend has given me some time to spend in my kitchen. A trip to Costco filled our fridge and freezer! We belong to a local CSA that gives us fresh veggies each week. It’s super fun because we get what the farm harvest’s each week- so it’s a challenge to use things that I might not usually buy at the store. It’s also great to know I have fresh veggies coming without having to make time to get to the farmer’s market. 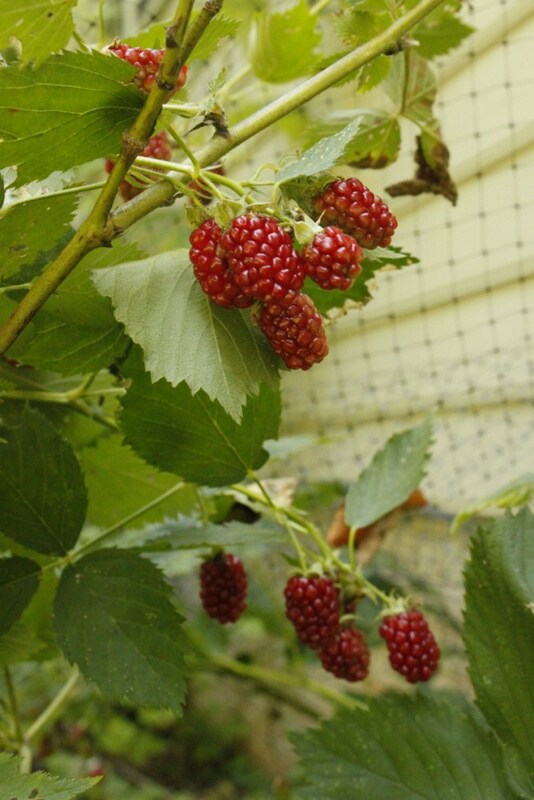 We also have blackberries growing finally!! I planted this bush when we bought the house 3 years ago and this is the first year we have actually gotten fruit!! Not only do we have a handful.. we have a BUSHFULL! There are some that will be ready in a few days, and another batch of green, that look like they have at least a week-2 weeks.. and then even a couple of new blossoms.. so hopefully we’ll have one more batch after that!! With the CSA we are getting a plethora of tomatoes! Gazpacho is the PERFECT use for all of them! I love my Mom’s recipe. I’ve been eating it since I was little! It’s super easy and a great way to use tomatoes that don’t “look” so pretty or are a bit overripe. 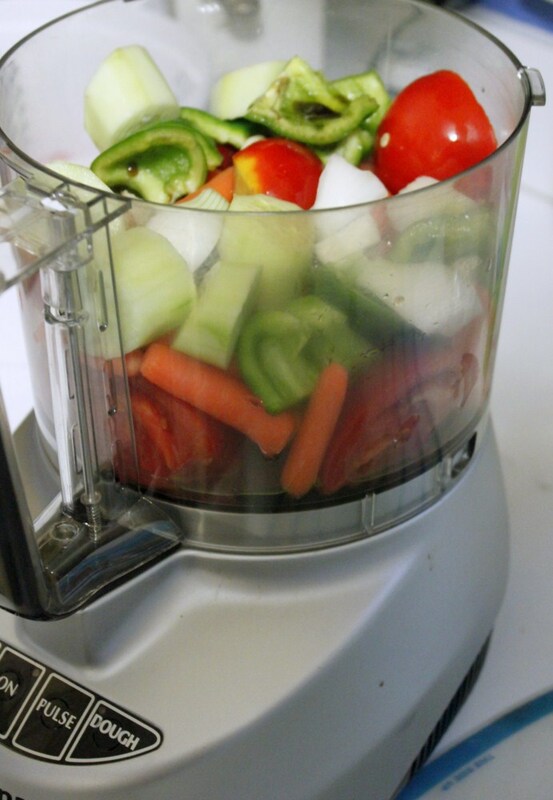 Whiz all together in the food processor. You can season it to your own taste. I don’t like spicy food, so mine is more garlic/balsamic heavy. 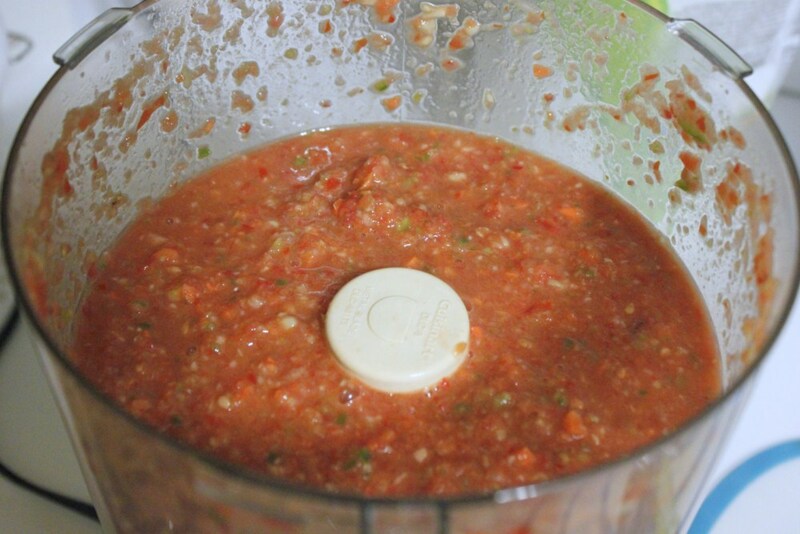 I have friends who add a jalapeno pepper to the veggies (if you add the seeds it will be more spicy), I have some friends who just add a dash of hot sauce when the serve it. Finished- still with texture- not too smooth! It’s wonderful served out of the ‘fridge on a hot summer day!! Also perfect for summertime is grilling!! We grill 3-5 times a week. We picked up some really nice flank steak at Costco. 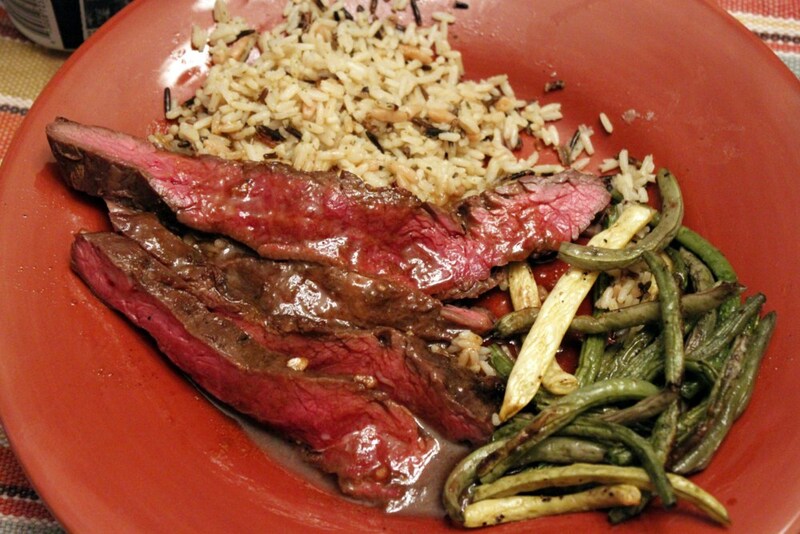 Flank steak is great because it’s not as expensive a cut of meat, and it’s very lean. You just need to make sure you have a good marinade, so you break down the connective tissue to make it melt in your mouth, rather than tough. Flank Steak (also works with skirt steak) is best served medium rare. Anything more done tends to get tough. Last night I used this really awesome Soy Honey marinade. The only thing I did a little differently was add a splash of bourbon to add to the breaking down of the connective tissue. I did reduce the marinade down by half and it made a wonderful, teriyaki like sauce. I also roasted some fresh green beans. I just tossed them with olive oil and a bit of cavender’s seasoning. (my “use it on everything” seasoning also that I got from Mom) I just put them in the oven on 450 for 20 min.. tossing them halfway through. These beans started green, yellow and purple, but the purple ones turned green as they cooked! I made some wild rice and the meal was complete!! 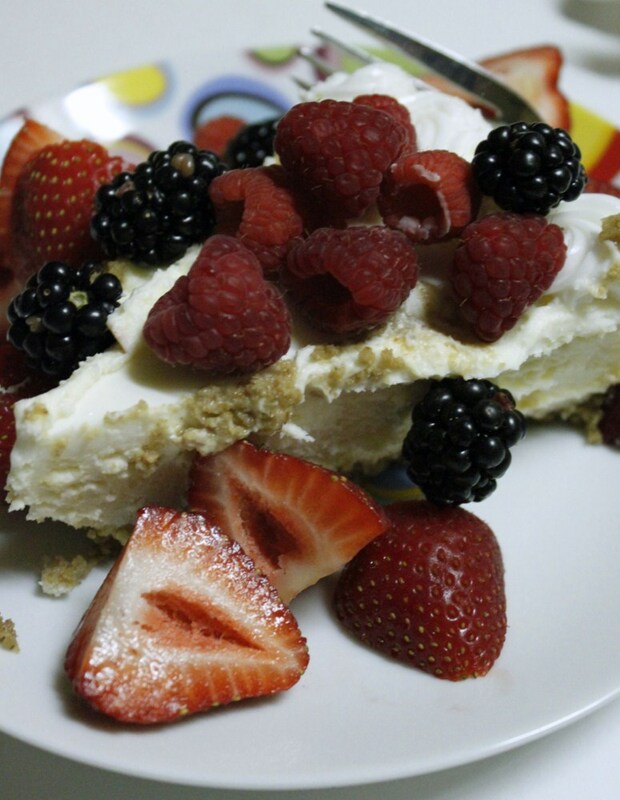 Dessert was Costco cheesecake (AMAZING) with fresh berries- including some blackberries off of the bush!! Tonight we’re planning Beer Can Chicken, with grilled corn, salad and grilled summer squash! With fruit salad and probably more cheesecake for desert! I’ll post photos tomorrow! I hope everyone is having a yummy and relaxing holiday weekend! !